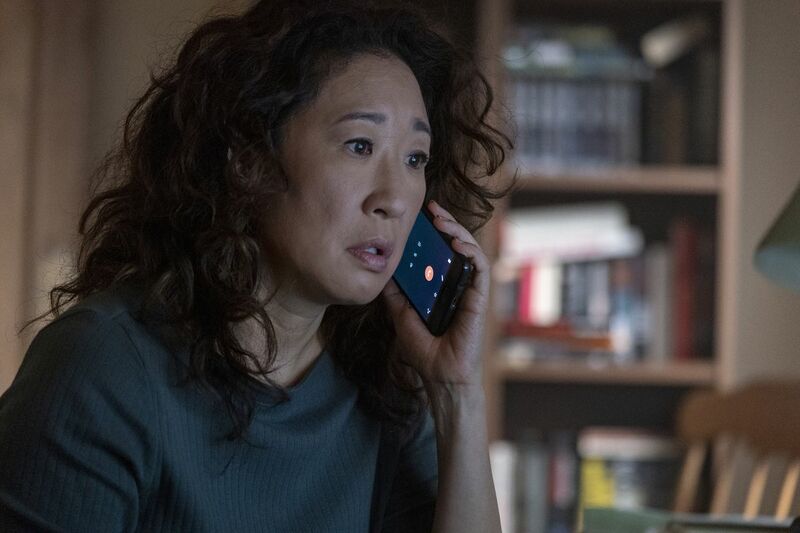 In the second episode of Killing Eve’s new season, MI6 agent Carolyn Martens (Fiona Shaw) introducesEve Polastri (Sandra Oh) to her new team as an “expert on female assassins.” Even though Eve’s empathy and perceptiveness give her an edge over her fellow agents when it comes to identifying how and why a woman might kill, it is the elusive Villanelle (Jodie Comer) about whom Eve is an expert. Eve explains to her team that while Villanelle is ostentatious in her kills, wanting to be seen (mostly by Eve, as she stages her hospital roommate’s body with a biblical bite taken out of an apple in his hand), the new killer and Villanelle’s competition uses her second-class citizenship — “older, an immigrant” — to murder in plain sight. By offering varying depictions of women in the spy genre, Killing Eve is a departure from the frequent costume changes of Jennifer Garner in Alias, Angelina Jolie’s thigh-split black dress in Mr. & Mrs. Smith,and La Femme Nikita’s titular blonde bombshell appeal to the male gaze. Though Villanelle certainly has an envious wardrobe, her style fluctuates from the severe patterned suit she wears to murder Eve’s friend and colleague Bill in a Berlin nightclub to her deliberately infantilized Big Pink Dress, a fashion moment to launch one of this season’s most recognizable red carpet looks. The dress is of color and style we typically associate with vulnerability or gentle femininity, and Villanelle pairs it with combat boots, a binary that is straddled again this season when she dons a pair of children’s pajamas. Yes, Villanelle is dressing for Killing Eve’s primarily female audience, but she’s also dressing for Eve herself, as we see when Villanelle gifts Eve an evening gown and the perfume from which Villanelle takes her name. By the same token, Eve is hardly the picture of the sleek, female spy of yore. When we meet her in the show’s first episode, she’s spilling croissant crumbs and speaking out of turn. She’s frazzled; her professional hunches are dismissed as “having a feeling”; and that iconic mop of curls betrays the platonic ideal of an MI6 agent, as is evidenced by the put-together woman who mistakes her blood-encrusted cuticles and self-harming with a pen for addiction as she scrambles to figure out what to do post-stab. Oh’s Asian heritage is important, too, being the first Asian woman in 39 years to win a Golden Globe for her role. Oh’s portrayal is a nuanced and welcome departure from racist depictions of spies in pop culture such as the Bond franchise and Lucy Liu’s at times stereotypical character in Charlie’s Angels (though scenes in which she plays up racist caricatures of Asian women could be seen as a prototype to the behaviors Eve exhibits above). Villanelle’s reliance on her conventional attractiveness — and our culture’s assumptions of women based on looks more broadly — is deconstructed almost immediately in season 2, when Villanelle is forced to undergo hospital treatment for a stab wound. She uses her feminine wiles to convince a taxi driver to take her to a hospital, and, when there, persuades the doctor to keep her admittance off the record by claiming she’s a victim of domestic abuse who needs to keep a low profile from her husband. Beauty is often equated with weakness or a virtue worth protecting, which Villanelle knows and uses to manipulate these men into doing what she wants. In the second episode, Villanelle has the tables briefly turned on her after picking up a middle-aged grocery shopper who takes pity on her bruised face and body. Back at his disturbing, porcelain doll-filled house, the man imprisons her alongside his dementia-stricken mother, depriving Villanelle of the medicine she needs to fully recuperate. The shrewd assassin leaves him with a knitting needle in his carotid artery and a toilet brush in his mouth for deigning to think he had the upper hand on her. To be a woman is to constantly be underestimated, and many of us have figured out how to use it to our advantage. Eve feigns a bathroom emergency to get out of a security checkpoint when she realizes she still has the knife she stabbed Villanelle with on her person. Oh emits her trademark hearty laugh when the above-mentioned woman thinks she’s an addict, instead of a (potential) murderer. “Women don’t stab!” Villanelle’s ill-fated bedmate exclaims when she tells him why she’s in the hospital. “I know. It surprised me, too,” she replies matter-of-factly. Although we are to assume that Villanelle is biologically female, she doesn’t subscribe to typical notions of femininity, while still allowing everyone to indulge in, and ultimately stumble over, the way she looks. Lest we mistake Villanelle for letting her guard down and forming a bond with the boy, she snaps his neck in response. Of course she wants to look normal; it’s what allows people to underestimate her as she continues her crime spree. With the introduction of a new female assassin who appears to use her normalcy to even greater effect than Villanelle, season 2 looks to further unpack how underestimating women is to our detriment. Scarlett Harris is an Australian culture critic. You can read her previously published work at her website, The Scarlett Woman, and follow her on Twitter @ScarlettEHarris.